It was a dark and windy night…have I got your attention? It was… well, maybe not so windy. I was standing on a corner at Greenwich Avenue in the Village. Misty. Yes, that’s the word for it…somewhere near mid-night or later when a rabbi on a Vespa drives up and says “Get on. I want you to meet someone”. Who’s going to argue with a rabbi on a Vespa at midnight in Greenwich Village? Not me. So I got on, my guitar in its soft black bag clutched to my side with my right hand, my left firmly around the rabbi’s waist as we took off heading uptown on the dimly lit damp streets of Manhattan. 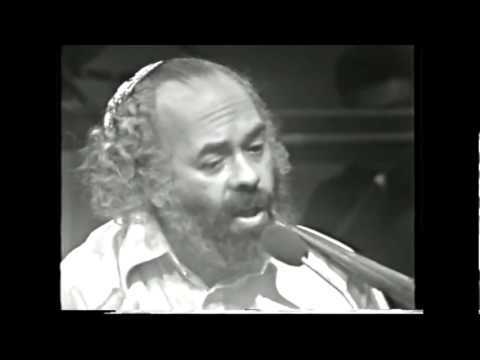 Rabbi Shlomo Carlebach was a friendly familiar sight in Greenwich Village in the late fifties. His energy, thumping guitar and boisterous voice was a regular feature in song circles, at Washington Square on Sundays. Good natured and generous, he lent a dimension to the folk music community that made it OK to tell your mom that you had decided to pursue a career in singing the music of the people. My mom used to call me every year when she saw Shlomo dancing the hora with John Voight on the annual Chabad Telethon. Fifty some odd blocks uptown and four cross-town avenues later at 1am, we pulled up in front of The Black Pearl, one of the many nighteries that poked their slender awnings to the curb on Second Avenue. Empty. Bartender cleaning up. Nothing daunted Shlomo. My hand firmly in his, he leads me to the rear of the club where a lone piano player is seated at a shiny black baby grand on a bare grey rug-covered riser. Noodling is what they call it. She was noodling. Introductions. They talk. She waves her arm over the empty tables and tells us that she’s probably going to head back home when this gig is over. Shlomo tells her how much he loves her talent and how important it is for her to stick it out. She hugs him and tells him how much she loves him. He sings her a line from a Yiddish song and she giggles. Everyone loves Shlomo. How can you not? Shlomo grabs my hand and yanks me up to the riser. I unpack my nylon string Goya guitar (didn’t everyone have one of those back then?) and tune it with some help from my new friend at the piano. I sit cross-legged on the riser, Shlomo is seated close by on a bar stool, I begin in C major. Gently, as is my style. A tumbling pulsing waterfall of piano notes turns our simple rendition of Dink’s song, written and sung years before by a hired woman at a migrant worker’s camp on the Brazos River, into a symphony.